Most desktop distros include at least one music player, which many people won't even think about changing. 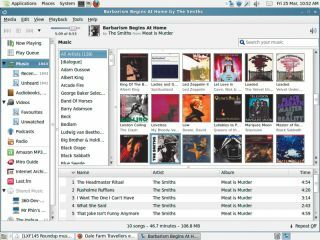 But with Ubuntu 11.04 dropping its old Rhythmbox application and opting instead for Banshee, our curiosity was piqued: which are the best music players for Linux? Direct comparisons between such diverse software may seem unfair - a bare-bones player such as VLC is competing for a different demographic than a bells-and-whistles app such as Amarok or Banshee - which is why we've broken the Roundup into categories. As Amarok is heavily integrated with KDE, we tested it on that desktop and, for fairness, tested Rhythmbox and Banshee on Gnome. VLC and Songbird were used on both desktops. We're after a music player that looks good; offers playback in as many formats as possible; enables us to access internet radio stations, such as LastFM; and to buy music from online stores. We've borrowed an iPod to see how well they all work on that, and tested them with our 8GB Creative Zen MP3 player too. We're using a mix of MP3s and Oggs - some we've downloaded from Vinyl Plus and Amazon, some we've ripped ourselves. The disparate nature of our collection should test the applications' ability to recognise the albums, and possibly even shame us into sorting them all out one day. You may think that, having bought a CD, you have the right to listen to it any way you want. Sadly, you don't: all you've done is licensed the music stored on the CD. The music companies want to impose restrictions, such as what devices you listen on, and how many people listen with you. They also want to stop you converting the music into different formats, and the formats themselves often have restrictions placed upon them. VLC, for example, gives users the ability to play DVDs that have been protected with the CSS encryption system, putting it in breach of the USA Digital Millennium Copyright Act. This is why we can't put VLC on the LXFDVD. This means that if you have a problem with codecs, it's almost certainly an issue with your distro. Users attempting to play MP3s with Amarok will have more success if they use Linux Mint than if they use gNewSense. This makes it tricky for developers, and the answer that most projects have arrived at is to break file format support into separate plugins, which can be installed at the user's discretion within the laws of wherever they are. Banshee, Rhythmbox and Songbird all use the Gstreamer back-end, which uses a plugin system to support a huge variety of file formats. If you have problems playing a file, you probably don't have the right Gstreamer plugin installed. Amarok uses the Phonon back-end by default, which doesn't enable playback of DRM-restricted files. It almost didn't let us play MP3 files either. If you're trying to use Amarok on the Gnome desktop, you'll probably see an error message saying it can't play MP3s. This is a packaging problem, not a problem with Amarok, though it could be made clearer how to fix it (we used Google). MP3s play fine on KDE, as do Ogg, FLAC, AAC, WAV, WMA and WavPack. VLC is cross-platform and has been around for yonks, so you'd expect it to be able to handle everything. It couldn't be simpler to rip a CD in Banshee. Unlike with separate ripping utilities, such as Sound Juicer, the tracks are automatically added to your library. It's just as easy in Rhythmbox, but we've found this function unreliable: we recommend you use Sound Juicer to do your ripping. Amarok uses a dedicated tool to rip CDs. The function you want is Extract Digital Audio With K3b. Songbird doesn't seem to have a way of getting audio from your CD collection (though there is a plugin to add this functionality). VLC can do it, but the option is hidden away under Media > Convert/Save. Whatever you think of Apple's locked-down, controlling business model, it does make some lovely, shiny hardware. We weren't expecting much success with our borrowed iPod Nano, but Banshee, Amarok and Rhythmbox confounded us, recognising the device perfectly, importing music into the apps and downloading cover artwork. Syncing with the iPod was easy too: you can do it with a right-click on the iPod's icon in Rhythmbox and Amarok, or from the configuration menu that appears when you highlight the device in the sources panel in Banshee. VLC simply opens a window displaying the iPod's entire contents (including calendar information, config files and the beep tone). It skipped any files it didn't recognise and started playing the first one it recognised, which happened to be an annoying disco tune. We wouldn't want that to happen every time we used the iPod. We also tested using an 8GB Creative Zen. This is pretty basic - we use it as a USB storage device, managing the files with the Nautilus file manager rather than a dedicated music playing app - but Rhythmbox and Banshee both performed just as well as they did with the iPod. Likewise in Amarok the device appeared in the source panel, with its contents displayed underneath just as it was in Banshee and Rhythmbox, although we did encounter problems with the version installed on the Gnome desktop. VLC, though, couldn't access the Creative device at all, despite recognising the iPod. Songbird did not work with either device - it's one for the web, not the real world. How you want your media player to look will probably depend on how you use it. If you like to set up a playlist, then minimise it to the system tray and forget it's even there, you're less likely to appreciate graphical niceties than someone who wants to get the most out of each and every feature. At least, that was what we thought. In practice, a well-thought-out interface makes sense no matter how long you're in front of the machine - you could even argue that the 'play and forget' brigade need a better interface, because they'll spend less time learning to use the software and so need to be able to find the features they do use quickly. The applications on test here vary in their approaches, so there's bound to be something you get along with. The first time you open Amarok, it presents you with the screen to the right. There's loads of blank, grey space, yet the application's slogan, "Rediscover your music" has been truncated to "Rediscov…". Nothing seems to fit, and because there are so many icons crammed in, it's not clear where to start. When you've populated your music library and expanded the application window to a sensible size though, things make more sense. Amarok uses a fairly traditional three-panel view, showing (from left to right) the music source; information that changes depending on the song that's playing; and a playlist view. The price for Amarok's high degree of configurability is a generally messy appearance, and the notifications that pop up when the track changes are surprisingly ugly. By default, Banshee uses the largest panel to display your albums with their cover artwork. This isn't as space-efficient as a list view, but it does give us something like the thrill we felt after saving up for a record, stroking the album artwork on the bus on the way home, and imagining what our new purchase would sound like. The GTK interface is clear and intuitive. It's easy to work out what to do if you want to play a song, and the menus are clear enough that you can perform more advanced manoeuvres, such as setting up a playlist, connecting to internet radio or managing a large collection. Banshee's interface is configurable to an extent, though nowhere near as much as Amarok. Typically for a Gnome application, the configuration tools are hidden from view unless you ask for them - not like Amarok at all. Songbird is a funny one. It's a web browser based on the Mozilla codebase, so its look and feel are completely different from the traditional music player. The main panel shows your music collection, you choose the media source from the panel on the left, and the control buttons are along the top. So far, so ordinary, but the main panel is actually a cunningly-disguised browser window! Click on the Help menu in the toolbar and www.getsongbird.com opens up in a new tab. It's similar to what other apps do - they're all grabbing content from the internet to add to your music listening experience - it's just that Songbird displays it in its original web page. A range of skins (here renamed 'feathers') enables you to customise the appearance, though further configuration options are limited. The powers that be in the VLC development team have chosen a traffic cone as the project's logo, which to us denotes something not finished, a work in progress. But maybe we've got the wrong end of the stick: maybe it's supposed to represent utilitarianism, for there's not a scrap of fat on the current VLC interface. We say 'current', but VLC has been in development since 1996 (that's about a million years in Free Software terms), and in all that time the developers have steadfastly ignored any graphical niceties. Toolkits may come and go, shaders, OpenGL effects and spinning cubes have passed them by. VLC doesn't give you much more than a standard file browser for navigating your music, with a basic window border. It works, but it's functional at best. Rhythmbox is the default music player in Gnome, and as such looks like a typical Gnome application. This is good and bad: good, because it's clean, simple and easy to navigate. Bad, because it's just a little bit boring. The left-most panel displays your available music sources, while the artist, album and individual tracks are listed in the largest panel. The rich metadata that you get with Banshee, Amarok and Songbird is absent, and as a result Rhythmbox feels distinctly clutter-free. Cosmetically, it's like a much better-themed version of VLC, which is no bad thing if you just want to listen to music in the background - or maybe it's just that the developers don't think we should be staring at a screen looking at lyrics and band biographies when there are more interesting things to be doing with our time?